The Chevrolet Corvette was first launched in 1953. Harley Earl played a large role in convincing the General Motors company to produce a two seater sports car. 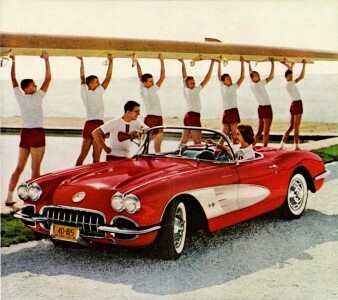 This jigsaw puzzle features an image from a magazine ad for the 1959 Corvette, a model year among what is known as the first generation Corvettes. Credit: Special thanks to Alden Jewell for making the photograph used for this jigsaw puzzle available through the Creative Commons Attribution license. Visit Alden Jewell's Flickr photostream. See all jigsaw puzzles based on Alden Jewell's photographs.